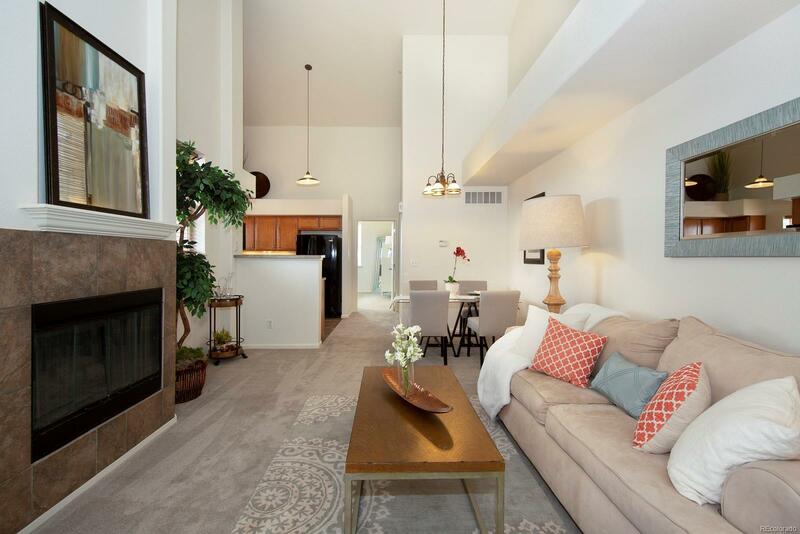 24' vaulted ceilings greet you in this spacious, open floor plan penthouse condo. This South-facing end unit enjoys peace and privacy. This home with new paint and new carpet will be an extension of your Denver Lifestyle via the new Light Rail. The station is just blocks away and will launch you to Union Station in 10 minutes. You can also hang locally in Olde Town Arvada with Denver favorites like Stueben's and Denver Beer Co. while still having Costco and Home Depot close by. Included in low HOA dues are a 24 hour gym, pool, hot tub and great party room. The open floor plan features a large kitchen, breakfast bar, dining area and a spacious living room with gas fireplace. The master bedroom and second bedroom are at opposite ends for great privacy. Den makes for an excellent home office, playroom, or 3rd bedroom (non-conforming). Large laundry room with high-end front loading washer and dryer. Private patio is great for bistro table or compact grill. Call your agent & call this home!